From Jul. 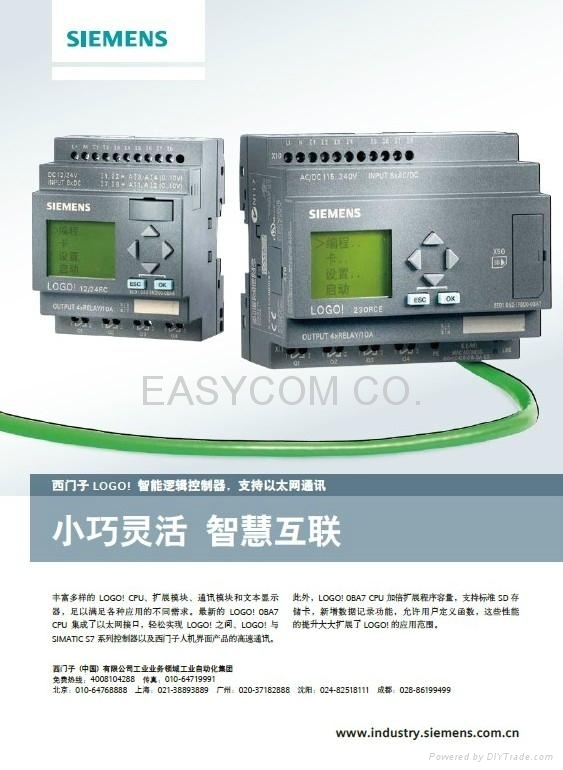 7th 2011 on, SIEMENS new generation of logic module – LOGO! 0BA7 can be ordered. LOGO! 0BA7 includes 2 basic modules: LOGO! 230RCE and LOGO! 12/24RCE ( E stands for Ethernet port). LOGO! 0BA7 basic modules integrate with Ethernet port, support Ethernet communication between LOGO! 0BA7 basic modules or LOGO! 0BA7 basic module and SIMATIC S7 CPUs, HMI Panels and PCs. Data logging function, user defined data can be stored in LOGO! internal EEPROM or standard SD card whose capability is no more than 8GB. User defined Function (UDF) increases the transplantation of function, it is good for the optimization of program structure. 8 bit Shift register increases to 4, more complicated applications are possible. Diagnostic information can be monitored on PC or integrated panel. 5 new functions: Astronomical time switch, stopwatch, Min./Max. function, Mean value function, Analog filter.